Royal Bali Collection 9K White Gold Band Ring, Gold wt 1.70 Gms. Super Auction- Manhattan Close Out 14K White Gold AAA Pink Sapphire (Ovl) Diamond Ring 1.030 Ct.. Gold wt 4.80 Gms. Why not go playful with your precious jewellery collection when you have some fine options to choose from? 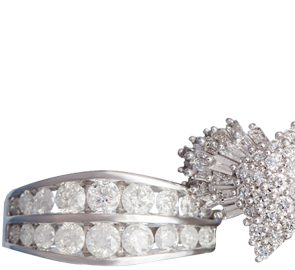 TJC take notes of the real fashion needs and let you bling the right way with its immense assemblage of some beautiful white gold rings. The undeniable uniqueness and rich workmanship so hold by white gold rings at TJC let you explore new lines of elegance. As they say, all that glitters is not gold, but we have actually made a concoction of gold and glitter in some enchanting hues of white. Now open a new leaf in fashion books, as you make an outstanding appeal accessorising with some masterpieces finely formed with high-quality diamonds ensemble with pure white gold metal. Ruby being the “King of Gems” pounds many hearts for the sheer beauty it delivers. The magnificent combo of white gold and ruby is no less than a marvel. So, indulge into the eternal bling of gemstone and white gold that embraces your personality and definitely make head turns. After all, what better way to explain the beauty of ruby fashioned with a gorgeous design of white gold metal? High on complementing each other, isn’t it? Next comes is the deep green emerald gemstone that accompanies the immense beauty of white gold in the most surprising way. At TJC, research and latest fashion trends in jewellery work hand in hand to finally assemblage a style that is spectacular to witness. Be the cynosure of all those eyes as you carry the bling and the purity of white gold and glare of emerald along. Pearl power is supreme as the calming and balancing act it performs for the mind is just what one need to dress their best. So, say hello to intricate white gold rings set with high-quality pearls for bringing the charismatic appearance. This concoction is a sight to behold and the skilled craftsmanship polishes it further to exhibit inexpensive white gold pearl rings. White gold is taking volumes of love and what's bad in showering some to your jewellery closet? So, rush into an unforgettable shopping spree with TJC!! !